Clicking the browse button of the "import from GGA"-option brings up a file browser. Clicking on a directory name will show the corresponding entries, clicking on a file name will select it and, in single select mode, close the file browser. In multiple select mode the file browser stays and you are able to select further files. Klick on the 'Submit' button on the bottom of the file browser when you are done. The base directories that the file browser will show are preset by the GGA system administrator. 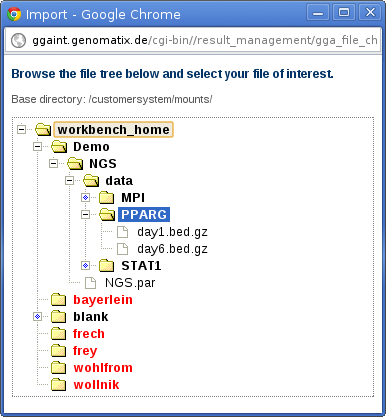 The GGA home directory where the home directories of the Bioinformatics Workbench users are located is available on every GGA as "workbench_home". Here, the demo data files used in the GGA Quickstart Guide can be found (see "workbench_home -> Demo -> NGS -> data"). In order to make a file available to the "import from GGA"-option just copy it into one of the base directories or a directory below. Directory names and file names shown in red can't be accessed respectively read because of their currently set file permissions. The file permissions of files and directories accessible for import have to be read (r) and execute/search (x) for your user account.